Who's in charge at Sports Illustrated? Earlier this summer, longtime editor Terry McDonell told his staff that he was dialing back on some of his responsibilities. Last month, he got a new office on (SI's parent company) Time Inc.'s corporate floor, fueling even more talk that he was on his way out. But if all signs pointed toward his departure, SI staffers still hadn't a clue about who would take over. 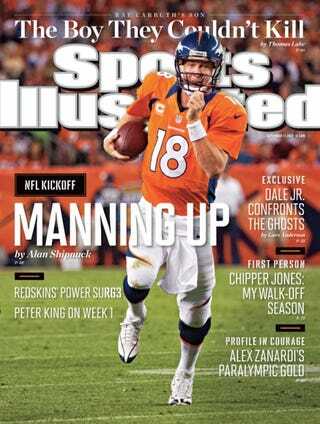 Who Exactly Is Running Sports Illustrated? Sports Illustrated Staffers Want To Know. Over the last few weeks, there's been some clarity. An old-fashioned bake-off is underway to determine who will be the next managing editor of the magazine. There's no official timeframe, but for now it's believed that Time Inc. editor-in-chief John Huey will make the decision over the next month or so. Stone has been with the magazine since 1992. He started as an NHL reporter and has edited baseball and NBA coverage, and the magazine's annual swimsuit issue. Over the last few years, he was seen as McDonell's heir apparent. Wertheim, on the other hand, wasn't even on the original list of guest editors getting tryouts. But since his inclusion there's been a groundswell in his favor. Wertheim has been with the magazine for 16 years, as the tennis beat writer for most of them. He has written or co-written seven books and he's been a steady TV presence. His appearances during CNBC's Bravo's Olympic tennis coverage were really, really good. The transition from magazine writer to top dog has happened before. When Tina Brown abruptly left The New Yorker in 1998, Conde Nast chairman SI Newhouse tapped career writer and reporter David Remnick after a strong recommendation from Vanity Fair editor Graydon Carter. Remnick has been in the job ever since. Whoever gets tapped will have a lot of work to do. SI was once Time Inc's second-biggest cash cow—behind People magazine—and has since slipped to somewhere in the middle of the pack. Its revenues have dropped at an even higher rate than most magazines at the company. Sources tell us that the weekly rotation of guest editors hasn't actually been that disruptive. The staff seems to be genuinely excited for either guy—the two are buddies—to get the job. The only thing that could interfere? If Time Inc. winds up tapping an editor outside of the magazine, or someone from another magazine within the company. SI has long been a Swiss village: loyal to its own, and oblivious to what's happening elsewhere within Time Inc.
Know more? Drop me a line. UPDATE, 2:38 p.m.: By the way, Sports Illustrated has gone the bake-off route before.